An emergency can hit your home at any time — whether it be a citywide natural disaster, or an isolated crisis such as a house flood or fire. And while it's hard to predict when the worst will happen, it's important to be ready and prepared for if it does. Birth certificates for each family member. Passports for each family member. Important USBs, computer backups, and external drives. It is also wise to keep some cash in this box. Ideally, between $500 and $1,000 will be enough to get your family through an immediate crisis. When a disaster strikes, you may not have the time or ability to access your bank accounts right away. This little cushion of cash can cover you until then. Thankfully, the internet makes it easy to access insurance policies, medical information, important bank and housing info, and beloved photos from anywhere. If you don't have access to these documents through online accounts, either keep physical copies of these documents in your safe, or scan them to a secure cloud storage site. If you have to evacuate your home quickly, it probably won't matter what's in your pantry. However, in the event a natural disaster or massive storm confines you to your home, you still want to keep extra, nonperishable food on hand in case you can't get to a store. Water bottles and a few gallons of water. Protein or granola bars and protein powder. Canned soup, beans, and tuna. Peanut butter or other nut butter. Beef jerky or other dried meat. Large containers of sugar, cornmeal, oats, oil, and flour. Jarred tomatoes and spaghetti sauce. 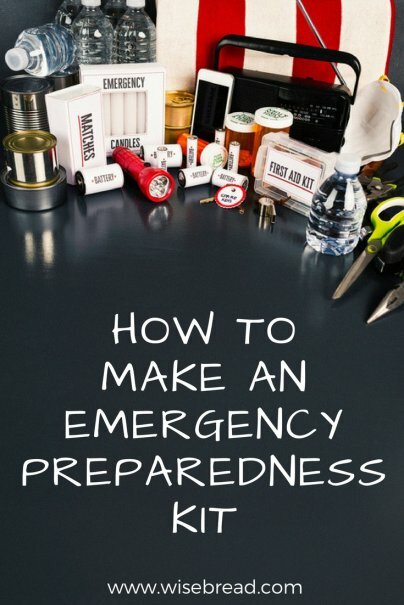 Buying a fully equipped pre-made emergency kit can cost you over $100. You can put together your own kit for less by shopping sales and buying a little each month. Just make sure to have a dedicated spot for your emergency items. You don't want to stash extra flashlights in one drawer and a respirator or water in a hard-to-reach place on the other side of the house. Keep everything in a clearly labeled 20 to 45-gallon tote in the garage, basement, or hall closet. A comfortable backpack or wheeled luggage to pack the items in. A first-aid kit with bandages, gauze, disinfectant pads, oxytetracycline tablets for diarrhea and infections, tweezers, scissors, antibiotic cream, and aspirin. Emergency power source or external battery that can act as a flashlight and charge phones. Extra prescription glasses for you or family members. A pocket knife and multifunction tool. Baby wipes and disinfectant wipes. Boxed water and water filters. A few food items with long shelf life, such as beef jerky, peanut butter, and protein bars.